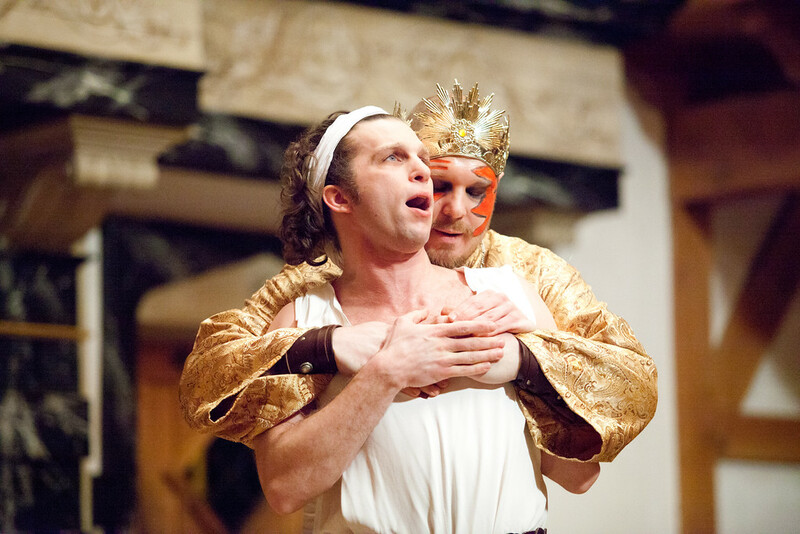 Gregory Jon Phelps and Benjamin Curns in DIDO, QUEEN OF CARTHAGE. 2012. 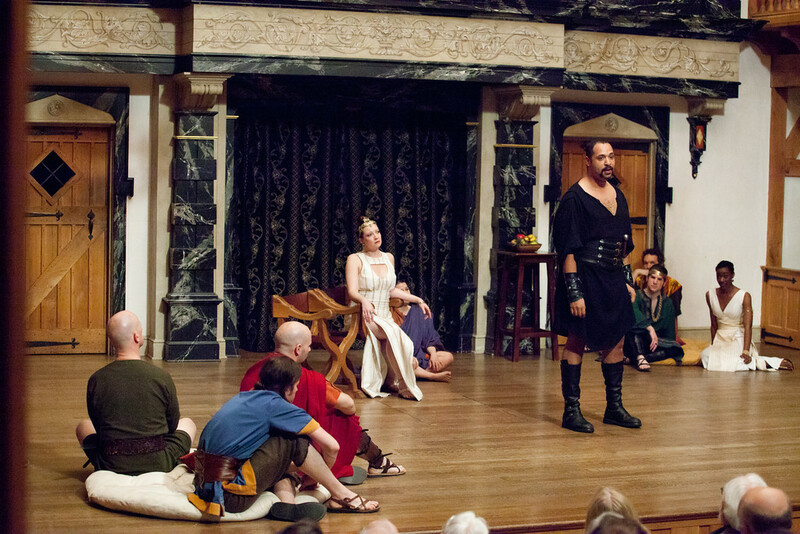 Gregory Jon Phelps in DIDO, QUEEN OF CARTHAGE. 2012. 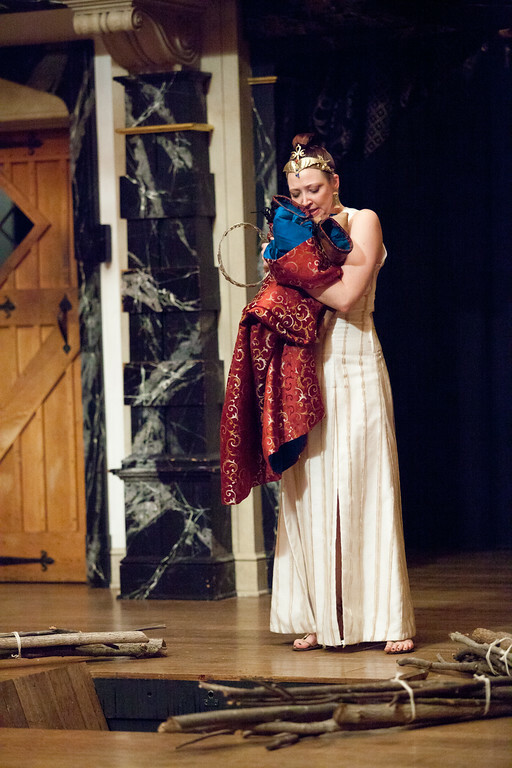 Allison Glenzer and Brandi Rhome in DIDO, QUEEN OF CARTHAGE. 2012. 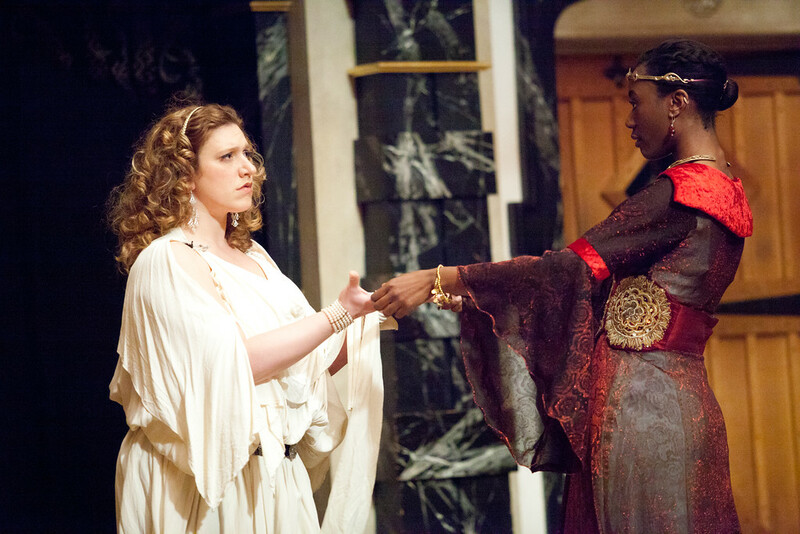 Sarah Fallon and René Thornton, Jr. in DIDO, QUEEN OF CARTHAGE. 2012. 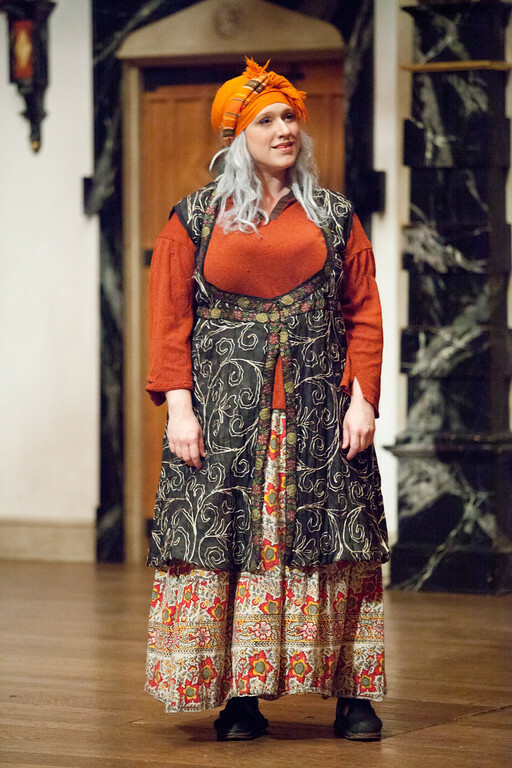 Allison Glenzer in DIDO, QUEEN OF CARTHAGE. 2012. Sarah Fallon in DIDO, QUEEN OF CARTHAGE. 2012. The cast of DIDO, QUEEN OF CARTHAGE. 2012. 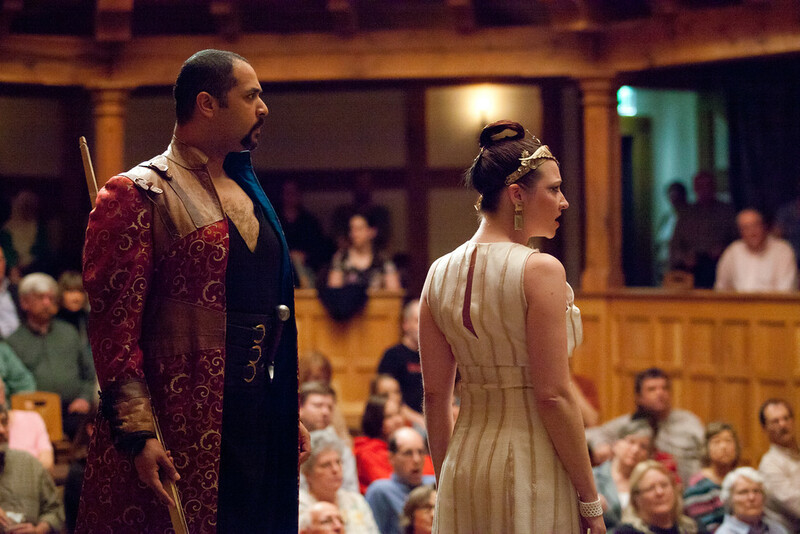 Gregory Jon Phelps and Sarah Fallon in DIDO, QUEEN OF CARTHAGE. 2012. 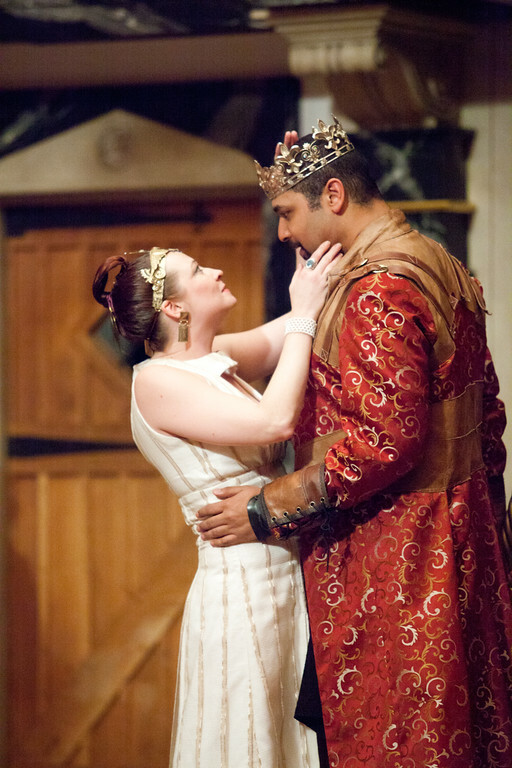 René Thornton, Jr. and Sarah Fallon in DIDO, QUEEN OF CARTHAGE. 2012. 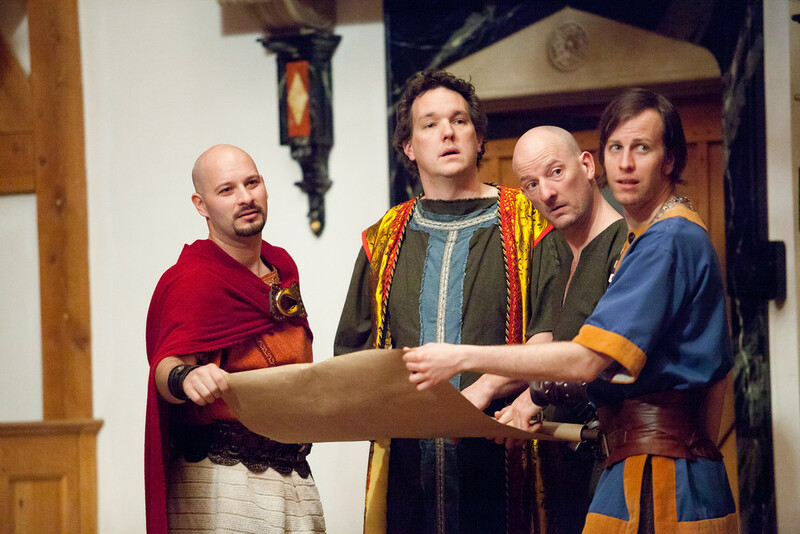 Jeremy West, John Harrell, Daniel Kennedy, and Chris Johnston in DIDO, QUEEN OF CARTHAGE. 2012. Ulysses, a Greek hero, delivers the gift of a giant wooden horse to Troy. As Troy falls, the gods command Venus’s son, Aeneas (a Trojan hero) to escape. Aeneas and his men set sail and roam the seas for seven years. Juno causes a storm to bring Aeneas to Carthage. Arriving on shore, Aeneas and a few of his men meet Venus (in disguise), who sends them to Queen Dido’s court. The other Trojans land elsewhere in Carthage and meet Iarbus, who invites them to the court. The Trojans reunite at court. Dido and Aeneas meet. Aeneas tells the story of the fall of Troy. 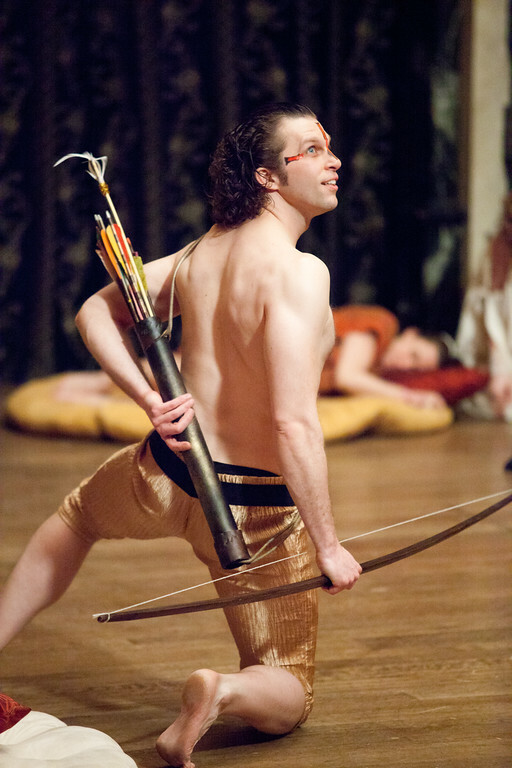 Venus kidnaps Aeneas’s so, Ascanius, and replaces him with a disguised Cupid. At Venus’s request, Cupid pierces Dido’s breast with his love dart. Dido falls in love with Aeneas. Dido offers to repair Aeneas’s ships on the condition that he stays in Carthage with her. Juno and Venus join forces in a plan to get Aeneas to marry Dido so that he will not leave Carthage. Dido rejects Iarbus, who is in love with her. During a hunt, Juno raises a storm, forcing Dido and Aeneas to seek shelter together in a cave. Aeneas promises to remain in Carthage. Iarbus’s jealousy increase when sees Dido and Aeneas leaving the cave. He offers a sacrifice to the gods in an attempt to win Dido. Anna, Dido’s sister, tries to make Iarbus love her instead. Mercury reminds Aeneas of his prophecy: he must go to Italy to found a new civilization. Aeneas understands he must leave Dido to fulfill his destiny. Dido hears of Aeneas’s planned departure and orders him back to court. Hard to say. All of Marlowe’s plays appeared between 1587 and 1593; but, because the play seems a transition from narrative poetry into drama, it’s probably on the early side. The title page of the 1594 quarto printing says the play was acted by the Children of the Chapel, a boys company, who played occasionally at the Blackfriars before it was renovated as a theatre. Christopher Marlowe (1564 – 1593), born the same year as Shakespeare, was the son of a shoemaker in Canterbury and earned a degree from Corpus Christi College, Cambridge. He had a meteoric career as a poet and playwright, was accused of heretical beliefs, may have been a spy, and was murdered in a tavern.  The sensational elements of his life have inspired modern works of fiction about him, including Charles Nicholl’s The Reckoning and Anthony Burgess’s A Dead Man in Deptford. Marlowe’s daring imagination, contempt for convention, and magnificent use of blank verse clearly inspired Shakespeare’s early work and his influence appears as late as The Tempest, where Prospero is in some ways Shakespeare’s version of Marlowe’s Doctor Faustus. Marlowe’s characters seem to inhabit a liminal space between the gods and man, while Shakespeare’s characters seem to inhabit our world. In the case of Dido, Queen of Carthage, some of Marlowe’s characters are gods, and the others are mythic heroes. here, more than in his other plays, Marlowe’s characters give speeches – beautiful speeches – to one another; Shakespeare’s characters talk to one another. Always admired for its poetry and its retelling of the Dido and Aeneas story from Virgil’s Aeneid, the play has recently begun to get more respect as a play. 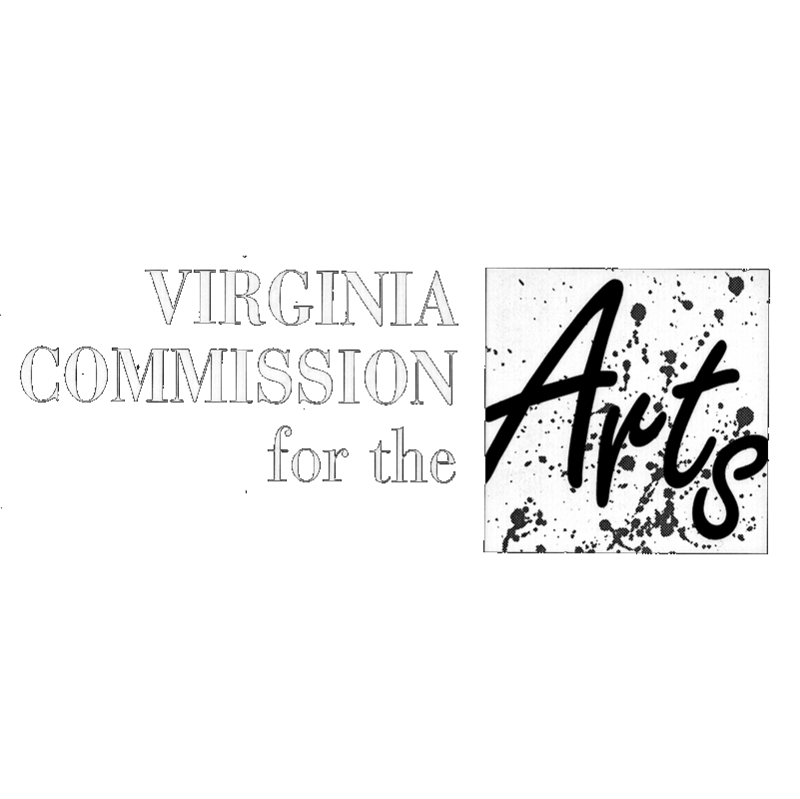 Six years ago in London, Angels in the Architecture produced the play to good reviews, and last summer the American Shakespeare Center Theatre Camp staged the play (directed by Riley Steiner) at the Blackfriars Playhouse. The consensus was that this is a play that deserves frequent production. Some question about how much of it, if any, is the work of Thomas Nashe. The title character is a magnificent role. The opening scene with Zeus, Ganymede, and Venus is weird and wonderful. The scene in which Aeneas leaves Dido is haunting.